The fraternity is administratively organized into independent Grand Lodges or sometimes Orients, each of which governs its own jurisdiction, which consists of subordinate lodges. The origins and early development of Freemasonry are a matter of some debate and conjecture. A poem is known as the “Regius Manuscript” has been dated to approximately 1390 and is the oldest known Masonic text. Obligations are those elements of ritual in which a candidate swears to abide by the rules of the fraternity, to keep the “secrets of Freemasonry” (which are the various signs, tokens, and words associated with recognition in each degree), and to act towards others in accordance with Masonic tradition and law. In regular jurisdictions, these obligations are sworn on the aforementioned volume of the Sacred Law and in the witness of the Supreme Being and often with the assurance that it is of the candidate’s own free will. Masonic Square – The Square and Compasses (or, more correctly, a square and a set of compasses joined together) is the single most identifiable symbol of Freemasonry. Both the square and compasses are architect’s tools and are used in Masonic ritual as emblems to teach symbolic lessons. 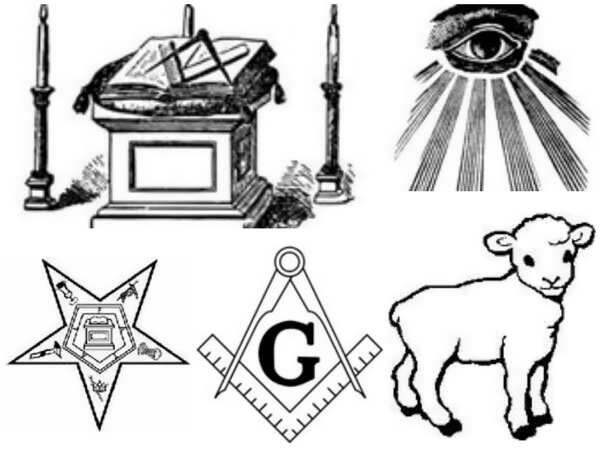 Some Lodges and rituals explain these symbols as lessons in conduct: for example that Masons should “square their actions by the square of virtue” and learn to “circumscribe their desires and keep their passions within due bounds toward all mankind”. Ark of the Covenant – The Ark of the Covenant reveals God’s Promise to David… and it is through this promise that we receive God’s continued mercy for our transgressions, today. That is the reason why the Ark of the Covenant is important to Masons. Masons believe that the Ark of the Covenant is the reason why Solomon`s temple was built. 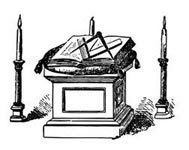 Masonic Altar – The Masonic altar, within the Masonic Lodge, upon which resides the Holy Books, is a symbol of our place of communion with God. In ancient times, however, the masonic altar was a place of sacrifice, atonement, and communion with God. Masonic Cable Tow – The Masonic Cable Tow is part of the dress of a candidate in which he agrees to go to the aid of a Brother with all his power and strength.” if it is within the length of his tow rope. The length of rope is symbolic of the first brother’s abilities. Masonic Lamb – The lamb is a symbol of innocence and purity. Hence it is required that a Freemason’s Apron should be made of lambskin. In the advanced Degrees, and in the Degrees of chivalry, as in Christian illustration, the lamb is a symbol of Jesus Christ. 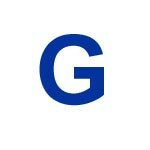 The Letter G – In Hebrew, the language our Bible was originally written in, it is called Gheemel (or Gimel) and has a numerical value of 3. Throughout history, we see reference to the number 3 when we speak of God. No matter which language we speak in, Gimel is the 3rd letter of many Semitic languages including Phoenician, Greek, Aramaic, Hebrew, and Syriac. The letter G in Freemasonry stands for both God and Geometry. Masonic Eye – The Masonic Eye is symbolic of the Eye of God. It is the symbol of his divine presence and his ever always present care of the universe. God is without a beginning and without an end because he always is and has always been. The Masonic Eye of God watches over each of us. Masonic Sheaf of Corn – The Masonic Sheaf of Corn, in King Solomon’s day, represented part of the money earned and reaped from the Master Masons’ labors. Today, the Masonic sheaf of corn is used as a symbol of a time long ago, mostly during the dedication, constitution, and consecration of a new lodge and in the laying of cornerstones. The Masonic Sheaf of Corn represents charity to the less fortunate. Masonic Shoe – The Masonic shoe which is also called the Blue Slipper, is symbolic of a physical confirmation of a spoken deed. 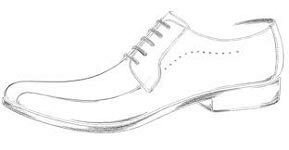 To unloose one’s shoe and give it to another person was the way of confirming a contract in ancient times. Masonic Star – The Masonic Blazing Star, not to be confused with the 5-Pointed Star, is one of the most important symbols of Freemasonry. “The Masonic Blazing Star, or glory in the center, reminds us of that awful period when God delivered the two tablets of stone, containing the 10 commandments to his faithful servant, Moses on Mount Sinai, when the rays of His divine glory shone so bright that none could behold it without fear and tremble. Keystone: As a symbol of completion, the Keystone is one of the most beautiful emblems of Masonic teaching. The Keystone is the last stone that is placed to complete the construction of an arch. This uniquely shaped stone is a marvel of engineering that is most critical for upholding the arch and maintaining its strength. The Keystone symbol is absent in Lodge symbolism but appears in degrees of the Chapter. It figures in the York Rite of Masonic degrees in Freemasonry in the unfolding of the symbolic legend of Hiram, the builder of the Keystone.